Student Taylor Hayden briefs Dean Jeff Braden before her PHI 210 course (Representation, Reason and Reality) in Withers Hall. 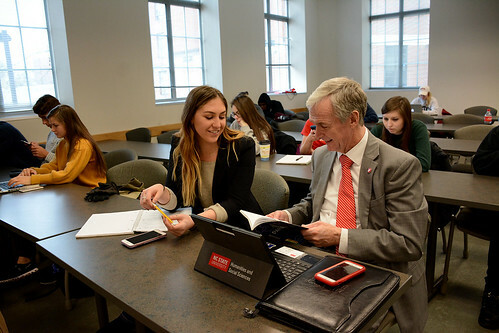 Humanities and Social Sciences student Taylor Hayden and Dean Jeff Braden spent a recent Wednesday attending classes, meetings and events on each other’s calendars. As part of the college’s annual Side by Side with the Dean contest, the two spent the day together on March 21. Hayden, this year’s contest winner, is a sophomore majoring in international studies and Arabic. Get a glimpse of her day with the dean in our photo gallery. As a parent, it’s hard to have your child leave home to go to college… especially when it’s 9 hours and 4 states away. However, these past 2 years, it is evident that Taylor has found the PERFECT school. She can barely contain her excitement when we talk about every aspect of her new “home” including the campus, professors, fellow students, advisors… the list goes on. Thank you to Dean Braden and the rest of the NC State family for turning a NE Ohio girl into a Southern girl. Go Pack! We are lucky to have her as a student! The pleasure is ours! !